Like many people, I used to approach bread baking with a slight sense of fear and confusion. On the rare occasion that I attempted a simple yeasted dough for something relatively non-threatening (we’re talking pizza dough here, and not, say brioche or pane pugliese), I was never satisfied with the results of the dough’s rise (everything always seemed to turn out rather squat and tough), and was therefore convinced that I was just not equipped with the proper set of skills or instincts with which most bread bakers seemed to have been born. Was my kneading technique not the right mix of gentle-yet-firm? 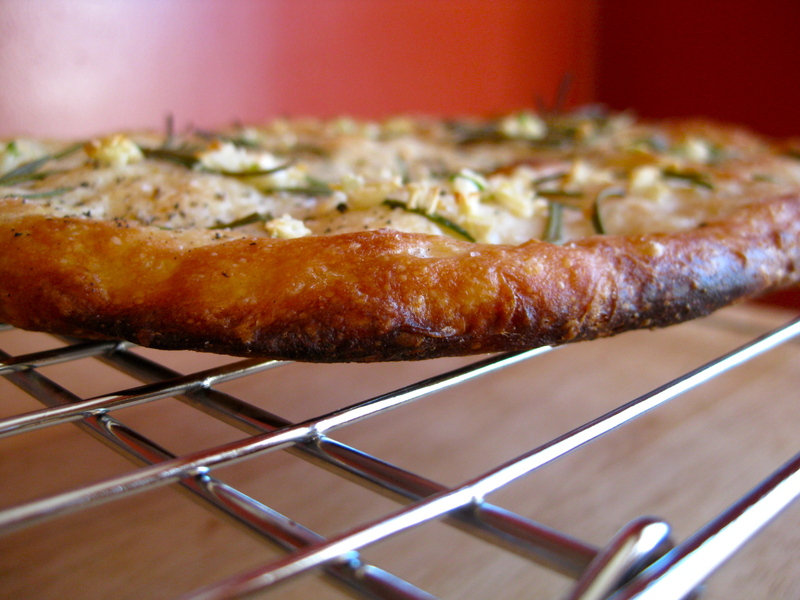 Was my kitchen too cold to coax out the dough’s full rise? Did I need to go out and buy a baking stone? Did I add too much salt? Not enough? As it turned out, the problem with my efforts was attributable not to a lack of technique or savvy, but rather to a lack of something even less instinctual: urgency. On every single one of my yeasted dough escapades, I was working with envelopes of yeast that had been purchased several months, sometimes even a year, previous, always while in the midst of a brief burst of bread baking confidence. Predictably, it always took me much longer than I had originally anticipated work up the gumption to attempt another yeasted recipe, so by the time I broke open the package of yeast, it was barely clinging on to life. Even under the best of circumstances, old and lifeless yeast is never going to bring an effervescent lift to dough, so, unbeknownst to me at the time, I was basically starting my task like Sisyphus in a boulangerie. So if you have a fear or dark anticipation of bread baking, might I offer you two bits of advice? The first bit of advice will be fairly obvious: throw away your old envelopes of yeast right now and make a fresh start by buying brand new yeast that is still full of bubbling life. The second bit of advice? 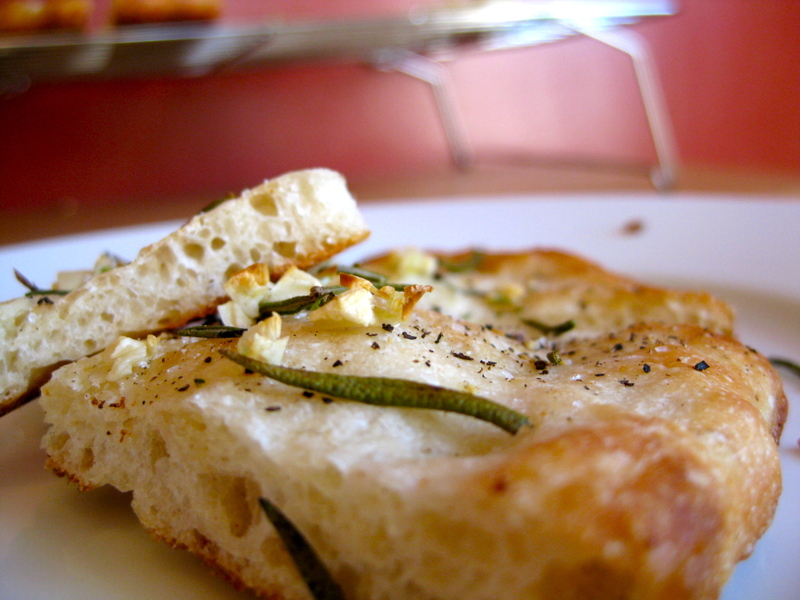 Make this dead simple focaccia. 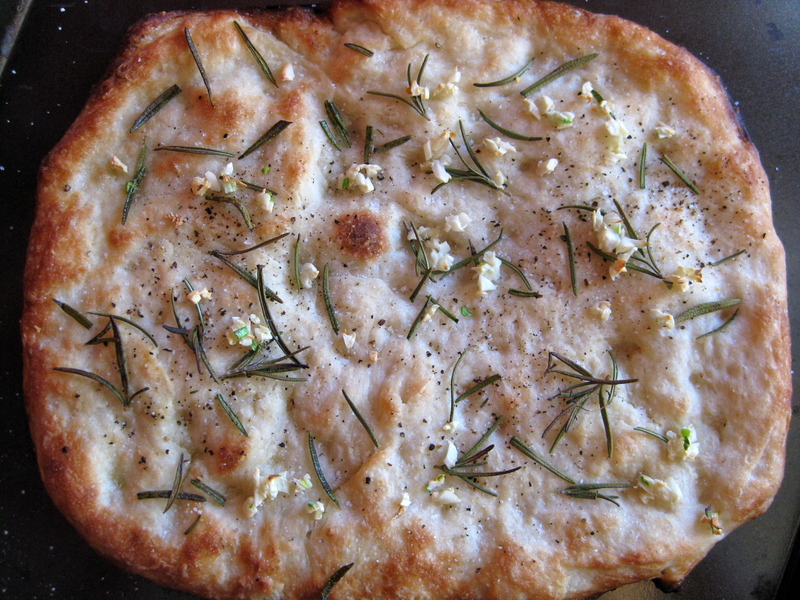 A perfect gateway recipe for first-time bread bakers, this focaccia requires no kneading, no special tools, and calls for just a handful of simple ingredients. Crisp, but with a light and toothsome chew, it’s simple to prepare, boasts an effortless rise, and bakes perfectly in mere minutes. Chances are, you’ve already got most of the ingredients in your house right now, and if you don’t, no worries. If you have to go to the store to buy some yeast, at least you’ll know it’s still fresh. Mix the dough: In a small bowl, whisk together the flour, yeast, and sugar. Then whisk in the salt (this keeps the yeast from coming into direct contact with the salt, which would kill it). Make a well in the center and pour in the water. Using a rubber spatula or a wooden spoon, gradually stir the flour into the water until all the flour is moistened and a dough just begins to form, about 20 seconds. It should come away from the bowl but still stick to it a little, and be a little rough looking, not silky smooth. Do not overmix, as this will cause the dough to become stickier. 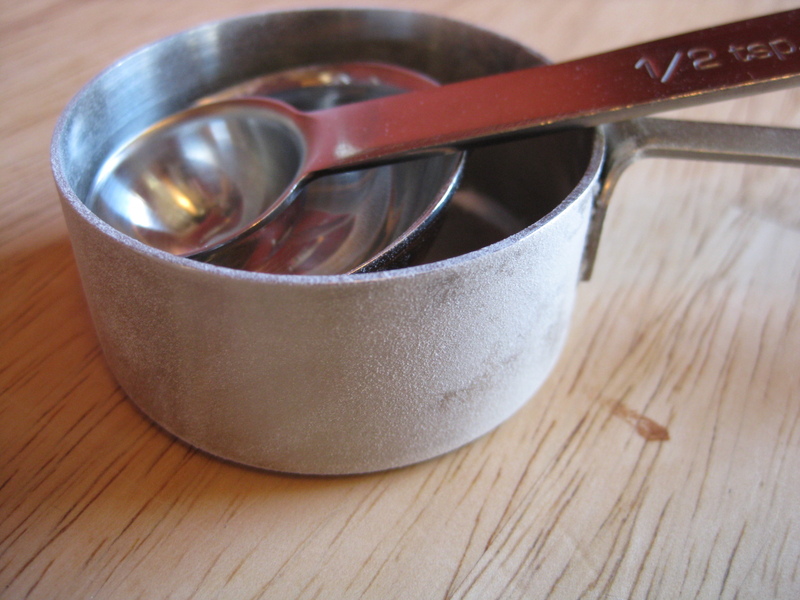 Let the dough rise: Pour the oil into a small bowl or 2-cup measuring cup. With oiled fingers or an oiled spatula, place the dough in the bowl or cup and turn it over to coat on all sides with the oil. Cover it tightly and allow it to sit at room temperature for 1 to 1 1/2 hours, or until doubled. Preheat the oven to 475 degrees F 30 minutes before baking: Have an oven shelf at the lowest level and place baking stone or heavy baking sheet on it before preheating. 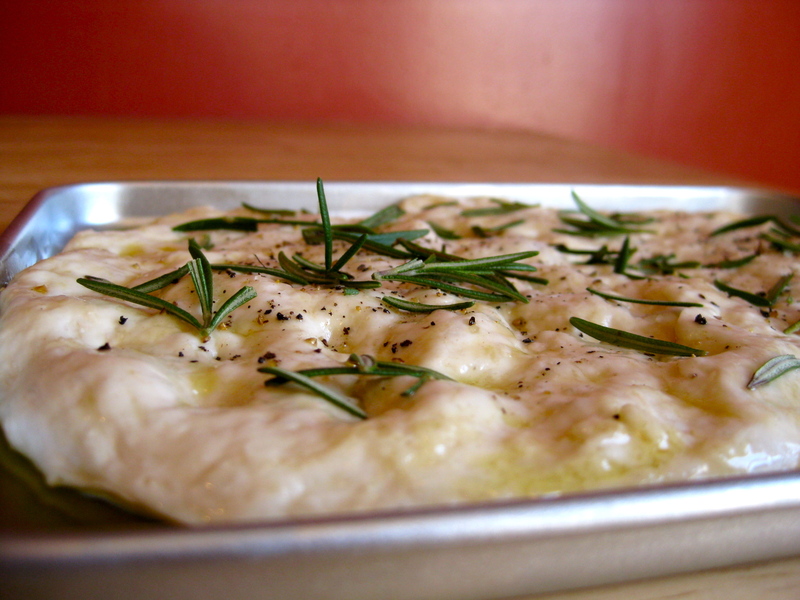 Shape the focaccia and let it rise: With oiled fingers, lift the dough out of the bowl or cup. Holding the dough in one hand, pour a little of the oil left in the bowl or cup onto a baking sheet and spread it all over the sheet with your fingers. Set the dough on top and press it down with your fingers to deflate it gently. Shape it into a smooth round by tucking under the edges. If there are any holes, knead very lightly until smooth. Let the dough rest for 15 minutes, covered, to relax it. Using your fingertips, press the dough from the center to the outer edge to stretch it into a rectangle about 9 inches by 6 inches and 1/4 inch high. If the dough resists, cover it with plastic wrap and continue pressing on it with your fingers. Brush the top of the dough with any oil remaining in the bowl or measuring cup and cover it with plastic wrap. Let the dough rise for 20-30 minutes more, or until light and spongy looking. 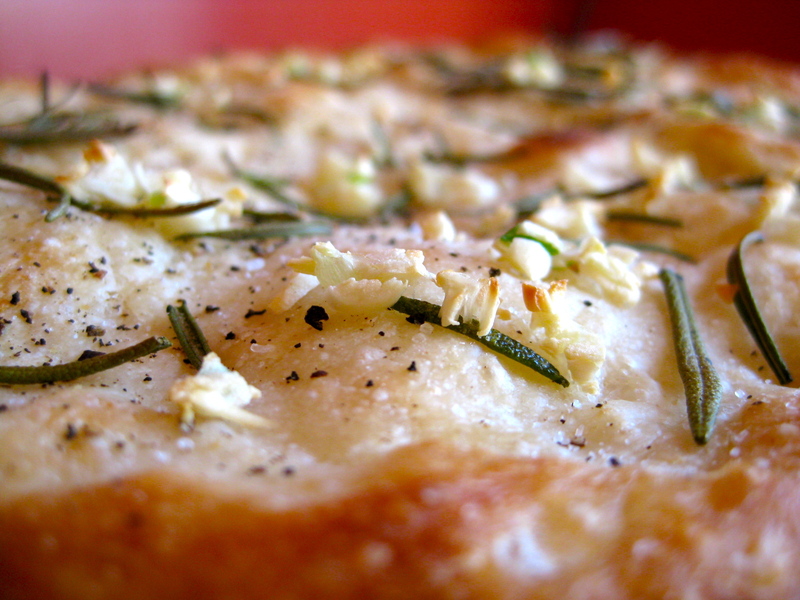 Bake the focaccia: Using your fingertips, press deep dimples at 1-inch intervals all over the dough. 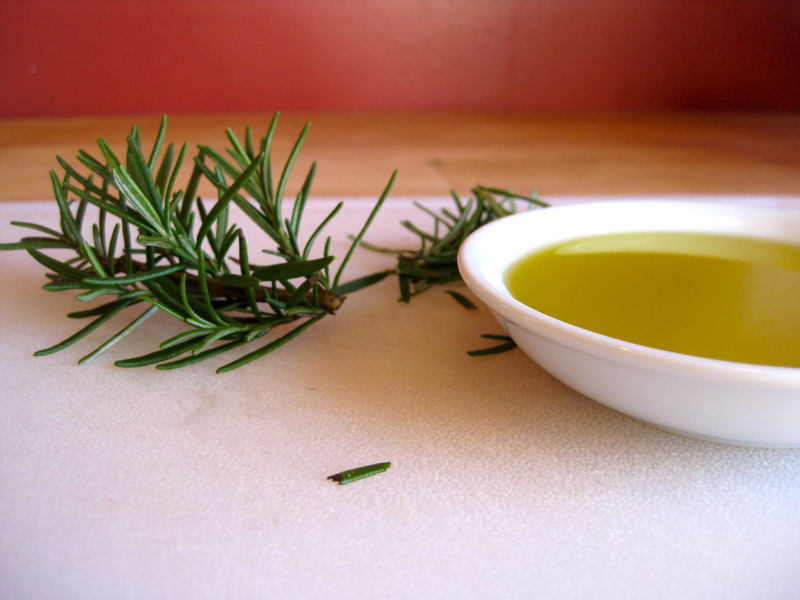 Sprinkle it with the rosemary, salt, and pepper. 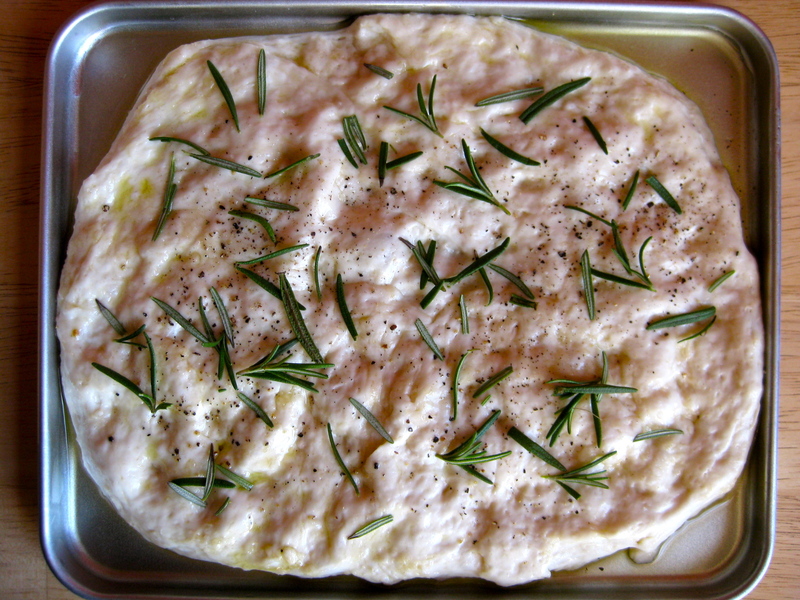 Place baking sheet with the focaccia on the preheated hot stone or hot baking sheet and bake for 5 minutes. Add the garlic, slide a pancake turner underneath the dough to loosen it, and slip it directly onto the stone or heavy baking sheet (this means you will be removing the oiled baking sheet upon which the focaccia spent the first 5 minutes baking). Continue baking for another 5 minutes or until the top begins to brown around the edges.